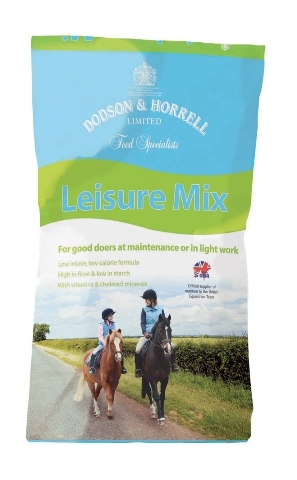 Leisure Mix is ideal for all adult horses and ponies that are either at rest or in light work and hold their weight well. If your horse or pony starts to do more work and requires a slightly higher energy diet, we recommend Pasture Mix or Cubes. Sixteen Plus Cubes are ideal for older horses and ponies that are starting to lose weight or condition, whether they are active or retired. If your horse or pony is continuing to do well on his current diet, we recommend you continue feeding this until he needs a veteran-specific feed. 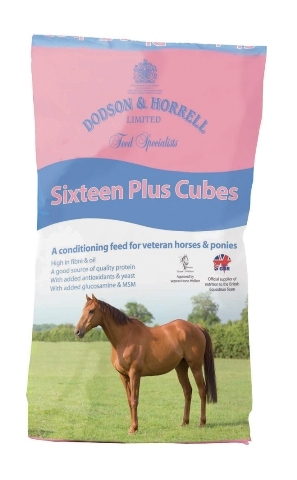 Sixteen Plus Cubes can also be fed soaked to veterans with poor teeth to make feeding easier. 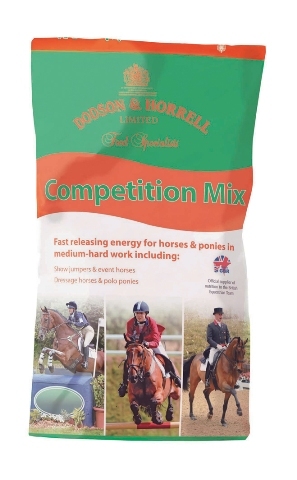 If you have an adult horse or pony in medium-hard work, the Dodson & Horrell competition feeds are for you. Whether your horse needs slow or fast release energy, the competition range has been formulated using the latest international research to ensure that your horses get all the nutrients they need for optimum performance. For example, our ERS Pellets are specially formulated to provide nutritional support for performance horses which are prone to muscular related disorders like ERS (equine rhabdomyolysis syndrome). 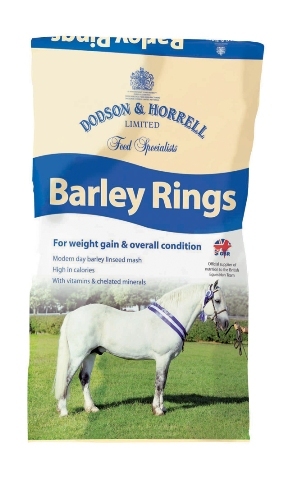 Barley Rings are a convenient, fuss free addition to an existing feed and can be fed dry or soaked. Barley is renowned for its conditioning properties and has been widely used in situations were horses have a requirement to gain weight or in situations were additional energy is required. 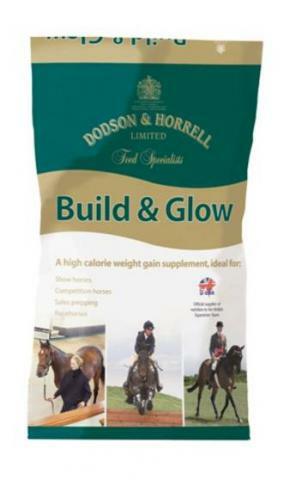 Build & Glow is a complementary feedingstuff specifically for horses and ponies needing to gain weight. Feeding guidelines: The quantity of Build & Glow recommended for weight gain is 100g/100kg bodyweight (e.g. 500kg horse = ½ Stubbs scoops (0.5kg) per day). 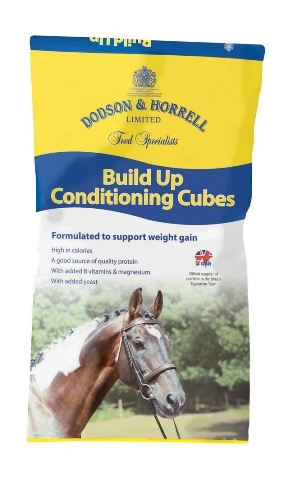 Build Up Conditioning Cubes are ideal for horses and ponies that have lost or are prone to losing weight and condition. Best results will be seen when fed in conjunction with the correct exercise programme. Build & Glow can also be added as a source of additional calories. Pasture Mix is an incredibly versatile product and one of the most popular on the market. It is a delicious, flaked cereal muesli formula and is ideal for horses and ponies in light-medium work, it can also be fed to horses in medium-hard work and the feeding levels should be adjusted accordingly. 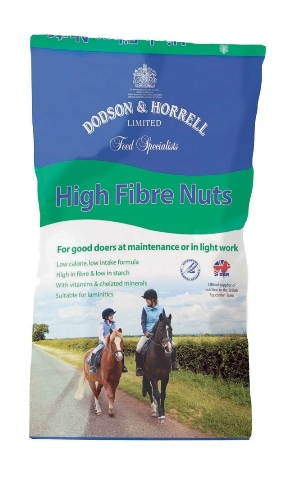 High Fibre Nuts are ideal for all adult horses and ponies that are either at rest or in light work and hold their weight well. If your horse or pony starts to do more work and requires a slightly higher energy diet, we recommend Pasture Mix or Cubes. A Simple Choice......With an array of products on the market and constant advice and research updates available to us, choosing the right feed can be challenging. All horses are individuals and just like us, they require specific diets developed specially to suit them. Remember to take into account weight and fat score, concentrate:forage ratio, workload, daily management routine, temperament and your horse's lifestage. The Dodson & Horrell range of horse feeds, supplements and herbal products have been developed to help make choosing what to feed a little easier. 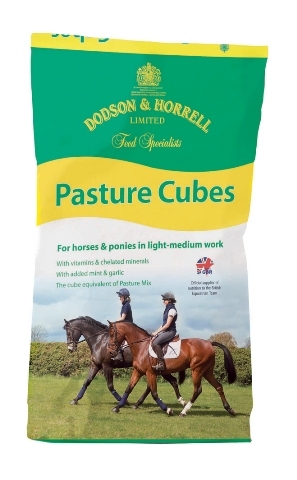 Pasture Cubes are ideally suited to horses and ponies in light-medium work but they can also be fed to horses in medium-hard work and the feeding levels should be adjusted accordingly. If you are looking for a similar nutrient value to Pasture Mix but prefer a cube then Pasture Cubes provide the answer. Sixteen Plus Mix is ideal for older horses and ponies that are starting to lose weight or condition, whether they are active or retired. If your horse or pony is continuing to do well on his current diet, we recommend you continue feeding this until he needs a veteran-specific feed. Build Up Conditioning Mix is ideal for horses and ponies that have lost or are prone to losing weight and condition. Best results will be seen when fed in conjunction with the correct exercise programme. Build & Glow can also be added as a source of additional calories. If your older horse or pony needs help to maintain or gain condition, a veteran-specific diet comes highly recommended. 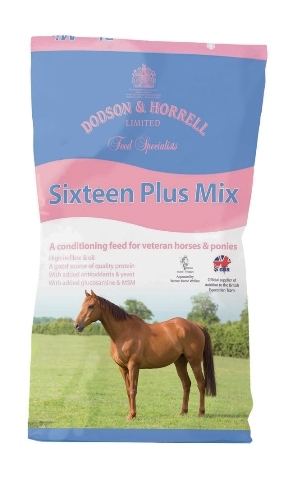 The Dodson & Horrell veteran feeds are specifically formulated to help combat weight loss through ageing and poor dentition and can be used for horses and ponies in work or retirement. Weight loss in horses and ponies can occur for a number of different reasons, including stress and cold weather. 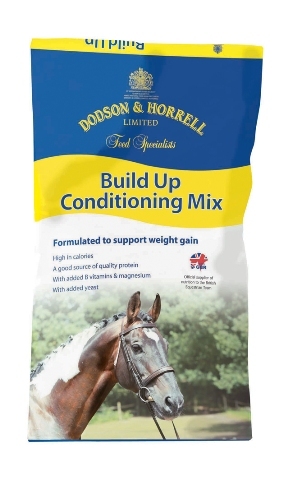 Dodson & Horrell weight and condition feeds are formulated to encourage weight gain and promote condition and top line when used in conjunction with a correct exercise programme. 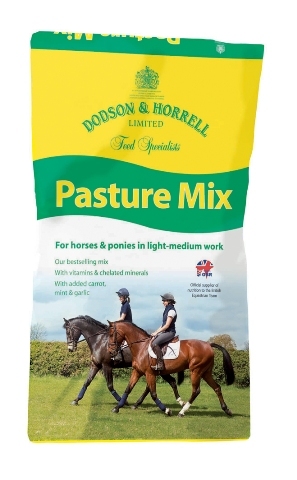 Equestrian & fam feeds can order in any Dodson & Horrell thats not in stock at the time. Just contact us. Formulated using the latest international research, Competition Cubes are a good source of quality protein and benefits from added B vitamins and electrolytes. It is ideal for horses and ponies that are competing and require instant bursts of energy. 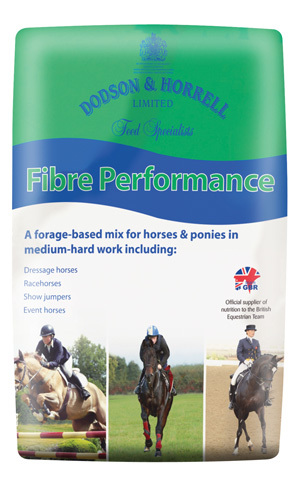 Fibre Performance is a complementary feedingstuff specifically for adult horses and ponies in medium to hard work. Fibre Performance has been formulated using the latest international research and is a forage-based mix for horses & ponies in medium-hard work. 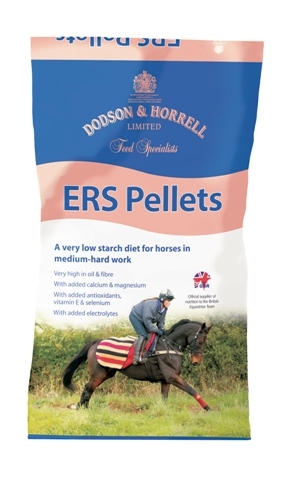 ERS Pellets are a complementary feedingstuff specifically for adult horses and ponies in medium to hard work requiring a very low starch diet. ERS Pellets contain very low levels of starch, making them the ideal choice for horses that are in medium-hard work and prone to muscular disorders such as equine rhabdomyolysis syndrome (ERS). This syndrome encompasses all the various terms including tying up and azoturia and some also include the genetic disorder polysaccharide storage myopathy (PSSM) in this syndrome. 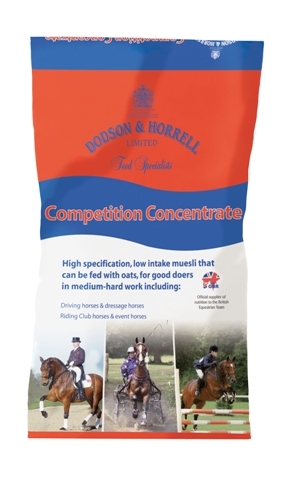 Competition Concentrate is a complementary feedingstuff specifically for adult horses and ponies in medium-hard work requiring a low intake diet. Formulated using the latest international research, Competition Concentrate is ideal for horses and ponies in medium-hard work that require instant bursts of energy yet gain weight easily. Supplies energy from cooked cereals. Oats can be added if additional energy is required. Benefits from added B vitamins and electrolytes. Suitable for driving horses, dressage horses, riding club horses and event horses. Formulated using the latest international research, Competition Mix is a good source of quality protein and benefits from added B vitamins and electrolytes. It is ideal for horses and ponies that are competing and require instant bursts of energy. 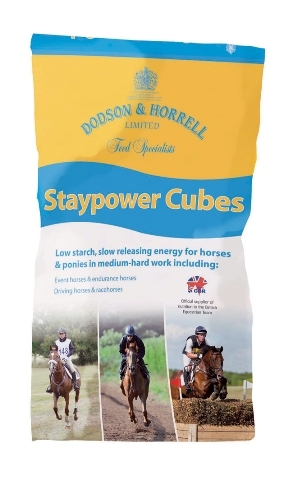 Formulated using the latest international research, Staypower Cubes provide energy from oil and fibre, are a good source of quality protein and benefit from added B vitamins and electrolytes. 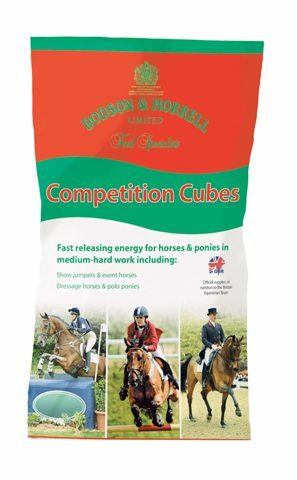 They are ideal for horses and ponies that are naturally quite highly strung or that are competing in stamina disciplines. They are equally suitable for National Hunt and flat racehorses requiring a low starch diet. 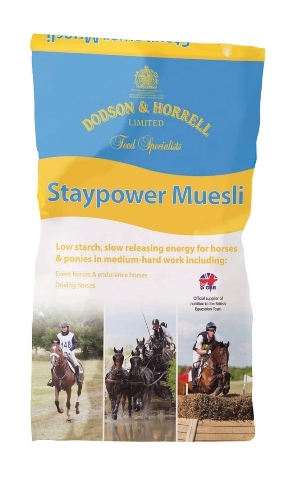 Formulated using the latest international research, Staypower Muesli provides energy from oil and fibre, is a good source of quality protein and benefits from added B vitamins and electrolytes. It is ideal for horses and ponies that are naturally quite highly strung or that are competing in stamina disciplines. Rabbit Pellets are formulated for growing, fattening and adult rabbits. Manufactured to a consistent recipe, they will provide your rabbits with everything required from their diet and are a cost effective means of doing so, making them ideal for the multi rabbit owner or commercial enterprise..
Chudleys Rabbit Royale is manufactured to a fixed formulation offering owners and breeders complete peace of mind. It is a complete muesli mix of pellets, micronised cereals, forage, herbs & vegetables and is suitable for adults and growing rabbits.